345 AD. 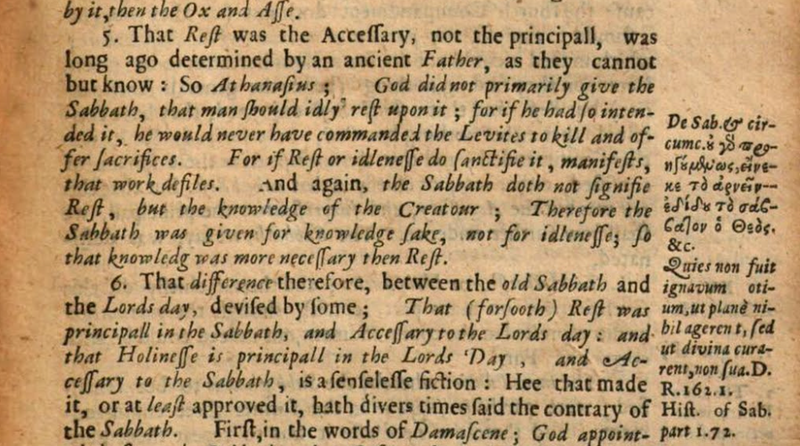 Athanasius: “The Sabbath was the end of the first creation, the Lord’s day was the beginning of the second, in which he renewed and restored the old in the same way as he prescribed that they should formerly observe the Sabbath as a memorial of the end of the first things, so we honor the Lord’s day as being the memorial of the new creation” (On Sabbath and Circumcision 3). Both works quoted are in fact dubia or spuria, and are listed as such in the great 18th century Benedictine edition of the works of Athanasius, conveniently reprinted by Migne as the Patrologia Graeca volume 28. De sabbatis et circumcisione may be found on columns 133-141, preceded by a note on the doubtfulness of the text; then there follows a note on the doubtful character of de semente, and then the text. De sabbatis et circumcisione is listed in the CPG as 2244. 9 manuscripts are listed in the Pinakes database, and no doubt more exist. The CPG editor notes its status, but adds that Karl Holl argued for its authenticity in Studien uber das Schrifttum und die Theologie des Athanasius, Freiburg i. Br., 1899, p.102 ff. (I was unable to locate this online). Richard Bauckham mentions the work in his Collected Essays II (2017) p.425 here, but advises that Willy Rordorf in Sabbat et Dimanche dans l’Eglise ancienne (1972) p.91 n.1 thinks otherwise. De semente is CPG 2245, equally spurious, and the text is in PG 28, 143-168. The CPG indicates the existence of a study of the tradition, and a discussion of its authenticity by no less than Marcel Richard. UPDATE: There is in fact a text and German translation of this work accessible online here. Some have seen this work as by Marcellus of Ancyra (see comment below). at Dominus diem Sabbati transtulit in Dominicam: neque nos auctoritate nostra Sabbatum vilipendimus; sed propheta est, qui illud rejicit ac dicit, [then Isaiah 1:13]. Non enim otii praecipue causa, hominibus Sabbatum Deus dedit, qui ait… [bible quotes]. Si enim cura illi esset de otiositate, non praecipisset Levitis proponere, offere, mactare. The second one is condensed more straightforwardly from the start of chapter 3. 3. Nequaquam igitur Sabbatum otium designat, sed tum cognitionem Conditoris, tum cessationem a figure huius creationis… [more bible quotes]. Cognitionis ergo et non otii causa datum est Sabbatum: ita ut sit cognitio magis necessaria quam otium. I’ve chosen to give the Latin rather than the Greek, in case those looking at this should want to locate the passages in the PG more easily, and perhaps experiment with some Latin translation tools. Considering the references to these texts down the centuries – since 1651!! – it is odd to find no trace of an English translation or either work. I might commission one of the first, as it is short. Thank you so much!! That’s great! Thank you – this is very interesting! Chapters II and III give chronological overviews with lots of citations (translated, and often quoted in Latin or Greek in the footnotes) – though a quick browse did not find (ps-)Athanasius among them. Thank you! That should be v useful!